In a town that takes its sports as seriously as Chicago, you better believe its local sports bars are met with equally fanatical devotion. And if you’re going to plan your entire weekend around what sports you’re going to be watching, you better know how to pick your sports bars better than your Kentucky Derby winners. From massive airline hangar-sized hubs to quiet little neighborhood dives, here’s everywhere you need to watch the Cubs, Sox, Bears, Bulls, and Blackhawks, not to mention college sports, soccer, and everything in between. Not only does this bustling Old Town sports hub boast 107-inch HDTVs and over 90 beers on tap, they also go so far as to employ a “video DJ” to play music videos and internet clips during commercials. The pour house has one of the biggest beer lists in the city and plenty of rich mahogany that would make a more sporty Ron Burgundy break out his vintage Chargers jersey. You can watch the game on massive flatscreens that line the bar or stop by after 11pm for their late-night menu which includes a comically sized 1.5-pound Bavarian pretzel. 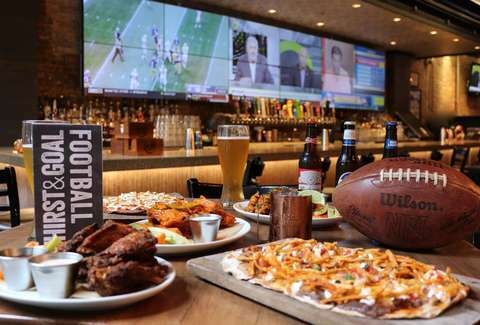 This otherwise tame '70s-style neighborhood sports bar erupts on game day, where the action is screened on two ginormous projectors (a 190-inch and a 150-inch) in addition to eight 65-inch screens and three 60-inchers. The menu is known for its great comfort food -- burgers, waffle fries, and criminally underrated wings to pair with a well-rounded beer menu and craft cocktails like The Buck (whiskey, lime juice simple syrup, ginger beer). 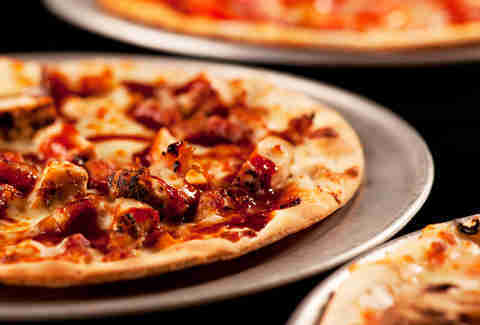 Stop by for Bears game day specials like $18 domestic buckets or $6 beer and a shot. This always-happening spot may boast one of the best sidewalk patios in the city, but during game day the real action unfolds inside, where the lively crew of patrons are always primed and ready to scream like maniacs at the TV. The popular gathering place is also well known for its grub, including some of the most well respected wings in the city. Stop by on Saturdays or Sundays for football specials including $6 Don Julio shots. But if you fail to plan ahead, be prepared to wait. While it is best known for that other kind of football, one of the city’s best international soccer bars also makes a damn fine spot to hunker down for some more local sporting action. With 30 TVs and a rabid crowd of fanatics from all corners of the globe, they’re also serving up English-style pub fare including fish and chips and shepherd’s pie in addition to Scotch eggs and three types of wings. Grab a spot early for a brunch of Guinness French toast or traditional English breakfast and keep the party going all afternoon. One of the most well-known sports bars in the city holds its reputation for a reason. Well, several actually. Open at 9am for Bears noon home games with a more upscale vibe than your typical early morning drinking excursion might otherwise indicate, The Scout covers all your sports bar basics while going above and beyond with interesting touches like their signature foot-long grilled cheese and game-day brunch to get you in the mood to crush mimosas like Khalil Mack crushes the pass rush. With 48 beers on tap and 72 HD flatscreens, as well as shuttles to Soldier Field during Bears home games, Timothy O’Toole’s rounds out the sports bar experience with a serious menu famous for the William “The Refrigerator” Perry-sized Big Timmy burger and a stout offering of wings that come in a variety of flavors including Irish ghost and maple bourbon BBQ. Partake in the “Big Timmy Challenge” to win a free T-shirt after you devour two half-pound burger patties piled high with bacon, four kinds of cheese, and onion straws with a side of Irish nachos. For a break from the typical cavernous, frat-bro-heavy downtown sports bar, stop in this low-key neighborhood hang where you can bring your own food (they don’t serve any) and shoot some pool without having to deal with lines or hassles. Instead of battling other patrons for seating and the attention of overworked servers, belly up to the bar and make some new friends chatting up friendly locals and just put whatever the hell game you want to watch on the TV. 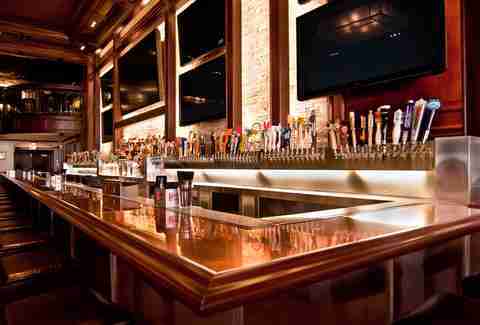 When you’re located within a two-block stumbling range of the United Center, you pretty much have to be a sports bar. The Ogden keeps its loyal acolytes satisfied with two 70-inch TVs covering the bar and personal TVs in every booth. It's also got a “chef-driven” menu including dangerously addictive “animal fries” topped with cheese curds, pulled pork, and a sunny side egg. And as the first bar in Chicago to offer happy hour after the stupid ban was finally repealed in 2015, they also take their drinking seriously, with a selection of over 50 craft beers and a variety of mules. Wrigleyville is famous for long-running sports bars like Murphy’s Bleachers and Yak-Zies where you can certainly have a good time, but it’s hard to beat the setting of this year-old spot located in the Park at Wrigley in the shadow of the Friendly Confines. 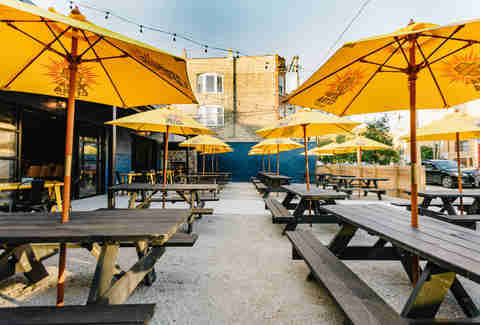 While it’s of course a great spot to watch the Cubbies, they also offer specials for Bears games and college football teams like Northwestern and Illinois. The multi-level space includes a beautiful outdoor patio overlooking the ballpark in addition to four full bars and a diverse menu including everything from lollipop lamb chops to pizza. 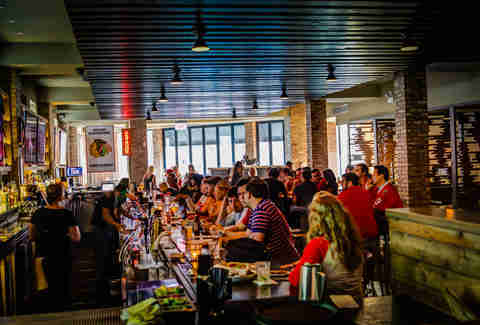 When Blackhawks players aren’t in the bar showing off the Stanley Cup or dousing the crowd with Champagne, The Pony remains one of the best team bars in the city, with team-approved road watches and bus trips. Games are broadcast on overhead plasma TVs and tables with individual flatscreens on the main floor, with a second floor lounge featuring a retractable roof and DJs on weekends. Standout eats from chef Brian Jupiter include tacos and the 16-inch grilled cheese known as The Clydesdale. Stop by for Bears games and college gridiron from Kentucky, Central Florida, and Texas A&M, in addition to the Hawks. Honest question: Do hipsters like sports bars? It may seem antithetical, but this newish Logan Square hotspot pulls it off with nary a second thought. With NFL Sunday Ticket playing on TVs throughout the dimly lit joint and a beautiful dog-friendly patio to relax in after the game, The Moonlighter will make a sports fan out of even the most jaded hipster bitching about the Super Bowl halftime show. A vegan-friendly menu of tacos, rose shots, and rum punch pitchers doesn’t hurt their cause either. 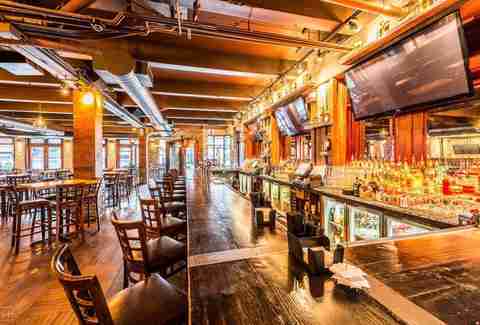 This popular 5,000-square-foot Bulls and Blackhawks viewing bar and pre-/post-game meeting place offers 33 plasma TVs, state-of-the-art sound, and shuttles to the nearby United Center in case you somehow missed its sports bar bona fides at first glance. Grab a rib sammy or Korean steak tacos in addition to a serious brunch menu of chicken & waffles and avocado toast, washed down with cocktails and dozens of beers. They’re also screening Michigan football for those of you post-collegiate types still jonesing for The Big House. This laid-back neighborhood spot isn’t trying to be anything fancy. Just a solid, pain-free spot to sit back, relax, and watch the game. Which is pretty much all you want in a sports bar, right? This hidden gem Bears game day watch spot also screens Wisconsin football in addition to Wednesday night trivia and beer specials during White Sox games. If you get hungry, the ridiculously diverse food menu features short rib sliders and mini-burgers in addition to broasted walleye and Italian beef pizza. With the tragic recent closing of Schaller’s Pump (RIP, old friend), this second location of quintessential Beverly Irish bar Cork & Kerry is claiming the mantle as one of Chicago’s leading White Sox bars. Located just a couple blocks from Guaranteed Rate Field with a turn-of-the-century tavern feel similar to its original South Side location, the popular game day hang features live music after every home Sox game and a menu of traditional Irish delights like Irish egg rolls and the South Side Irish burger topped with Irish bacon, Dubliner Cheddar, and egg.